Born in the glory years of the Roaring Twenties, a 1928 Packard Eight Dual Cowl Phaeton was a plaything of the wealthy classes. With the Great Depression coming on, they were a glittery contrast to the real world. Today we consider them automotive art as much as icons of a bygone past. The accoutrements of a lavish lifestyle are seen throughout this unique 1928 Packard Eight Dual Cowl Phaeton. It is being offered at sale by Daniel Schmitt & Company out of their St. Louis Automotive Gallery. Finished in medium brown with dark brown beltline, the contrasting black fenders, and the burnt orange disc wheels help create a stunning art deco look and stance. This Packard is known as a Custom Eight Model 443, a five-passenger touring car, and is considered a “full classic” by the Classic Car Club of America (CCCA.) Notice the photos of the dark tan leather interior provided in the ad layout (click here to review photos on the ad page.) Although it has undergone a beautiful restoration in the past, today a beautiful light patina presents wonderfully. This car is significant because of its dual cowl windshields and sporting phaeton coachwork. Some of the Packard’s refinements include wind wings, cowl lamps, outside mirrors and a trunk rack. A past owner had installed a set of wooden cabinets behind the driver’s seat. The wood dash and door trim are restored to a deep gloss. The iconic Packard radiator shell is protected by a stainless steel stone guard. The folding luggage rack was to accomodate a removable trunk. A rear folding tonneau windshield could be adjusted by the rear passengers to keep them un-ruffled during top down touring. This 1928 Packard Eight Dual Cowl Phaeton has the correct 6.3 Liter 385 ci L-head Inline-8 engine. The “Big Eight” had nine main bearings. 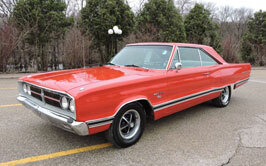 The car came with a manual 3-speed transmission and was equipped with drum brakes and all four wheels. The Bijur chassis lubrication system was used to keep lubricant to the front and rear leaf springs with a pedal under the dash. The Packard 443 model was unveiled on July 1, 1927. These new “Big Eight” models were still considered part of the 4th series of Packard and all rode on an imposing 143” wheelbase chassis. Thus the 443 designation. The Packard 443 catalog offered no less than twenty different body types to suit the needs of its clientele. It was left to the coach builders to design the bodies. Custom offerings from such noted coachworks as Derham, Dietrich and Fleetwood produced the final product. “Original Creations by Master Designers” was a catch phrase which Packard used to lure their customers. 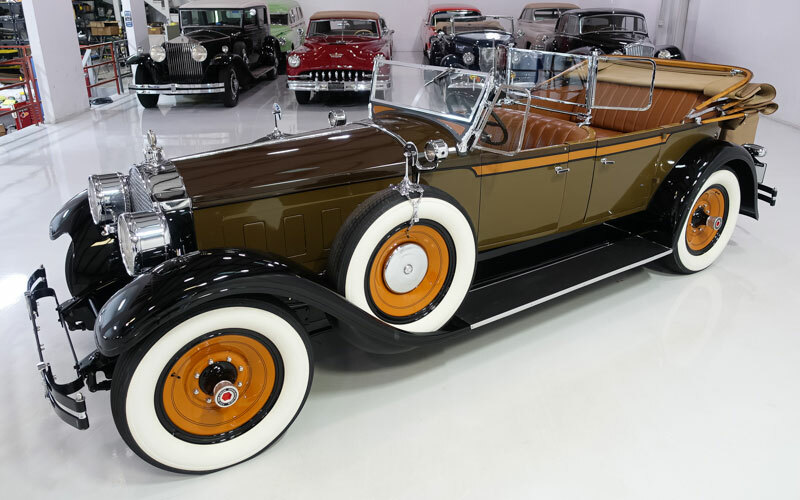 While approximately 7,800 of the Packard 443 chassis were built for 1928, the varying bodies meant that individual production numbers were quite low, with open bodied cars being procured by the most affluent of clientele. Body style 311 was the Custom Eight 443 5-passenger Phaeton. The NADA blue book guide for classic cars lists the value of this car at $295,200. Daniel Schmitt & Company is offering this vintage classic car for sale at $199,900. 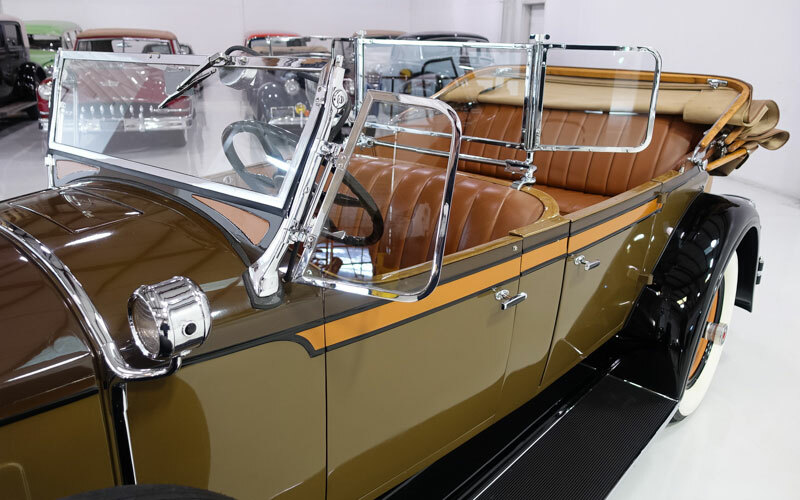 Today, the Packard 443 Phaeton is considered to be one of Packard’s most desirable collector models because it achieved a level of engineering, style and luxury that could only come from Packard. 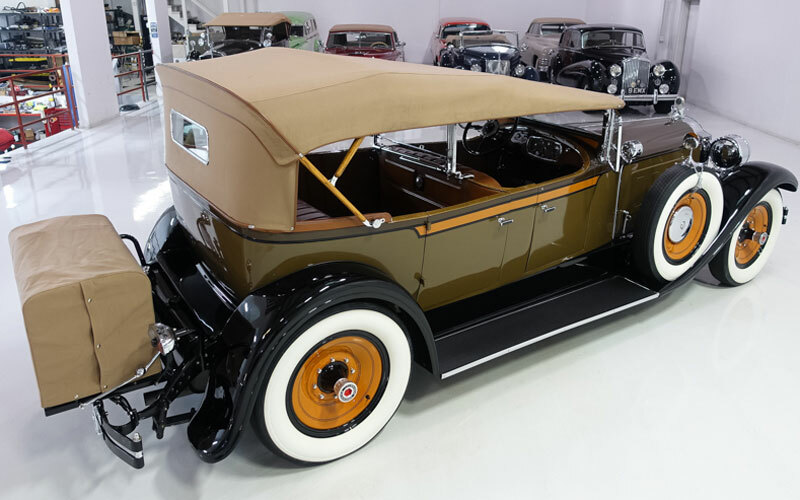 This 1928 Packard Eight Dual Cowl Phaeton is featured this week in the Cars-On-Line.com newsletter. Follow this link to read this week’s newsletter online.